Yay for presents, yay for shopping, and yay for giving friends and loved ones awesome gifts. 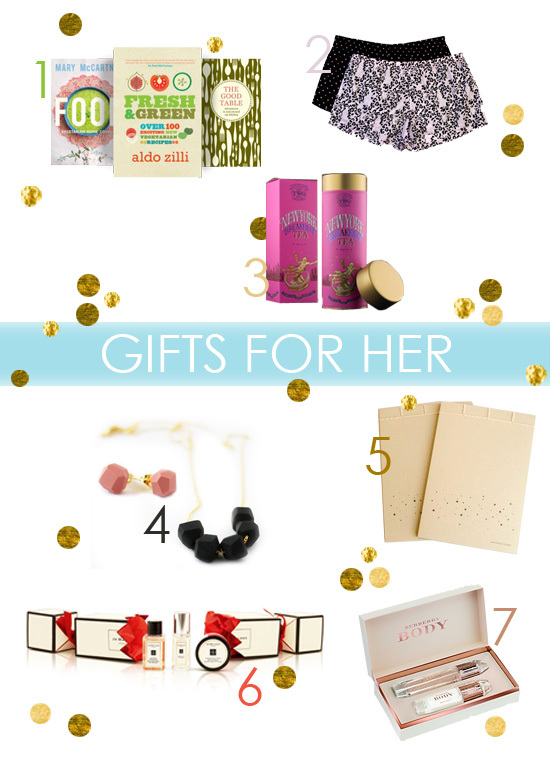 We've compiled a list of a few favourite gift items for the special women in your lives. There's something for everyone, so take a look and let us know what you would want off our list! 2 // Who would turn their nose up to super cute PJ shorts? This double pack from Woolies is the perfect stocking filler at only R170. You could even split the pack up among two gifts if you really want to be budget-friendly! 3 // For your tea-loving friends, there's no better gift than a tin of specially blended teas from local company, The Tea Chest. We love their contemporary packaging - especially the New York Breakfast Tea, pictured above (R299 / 100g). 4 // We've been following A Merry Mishap for quite some time now and we adore her Geo range of jewellery. They come in a variety of colours. Get the Black Geo Necklace* (R320) and the Plush Pink Geo Earrings* (R195) from the AMM online Etsy store. 5 // Awhile ago we let you in on our best kept secret, the local online store, We Heart This. There are a wide range of great and affordable gifts available there, but these beautifully crafted dotted notebooks take the cake. Get these hand bound beauties for R90. 6 // We couldn't agree with Victoria from Kiss, Blush and Tell more about how fabulous the Jo Malone Christmas Cracker Gift Set is. It's beautifully packaged and consists of 15ml Pomegranate Noir Body and Hand Wash, 30ml Lime Basil and Mandarin cologne and Necatarine Blossom and Honey Body and Hand Lotion. Get it for R294.95 from Stuttafords. 7 // Burberry Body checks all our fragrance boxes. We've been in love with it since one of our work colleagues starting wearing it. With base notes of sandalwood, cashmere, musk, amber and vanilla, you can expect and deep and sensual perfume, topped off with middle notes of Iris and Rose and finished with top notes of Freesia, Green Absinthe and peach. We're in love with this fragrance! Get the gift set consisting of the 60ml EDP and a 35ml body lotion for R819.95 from Stuttafords. All pictures credits found in the above paragraphs.